In winter especially, caribou retreat deep into the forest, often along ridge tops where lichen grows, in order to steer clear of wolves. It is well known that logging roads provide easy access for wolves deep into caribou territory and logging roads alone have been known to tip the balance of the predator/prey relationship between wolves and caribou. Logging roads are at least partly to blame for the disappearance of the caribou in BC, Idaho and Montana. Now, think of clearings for pipelines, electricity transmission lines, roads to fracking wells, and roads and clearings made for wind turbines (installation and maintenance). All these incursions into the forest give wolves easy access to the caribou herds, and wolf populations initially increase in these areas, as they eat more caribou. (Eventually, of course, the caribou population crashes and the wolves must find other prey). Because of this, some forest rangers and indigenous peoples are advocating for killing wolves so as to save caribou populations. They don’t want to kill the wolves, but this is the bind we have created in our modern world, where we end up committing more atrocities in the name of saving something else. It is similar to the atrocity now happening in the Salish Sea, where some are advocating killing seals and sea lions in the name of saving salmon. We humans are the ones who have created and continue to create the imbalances in nature that would otherwise sort themselves out, and yet it is the creatures in the wild who always suffer at our hands because of the damages we inflict upon the land and sea. 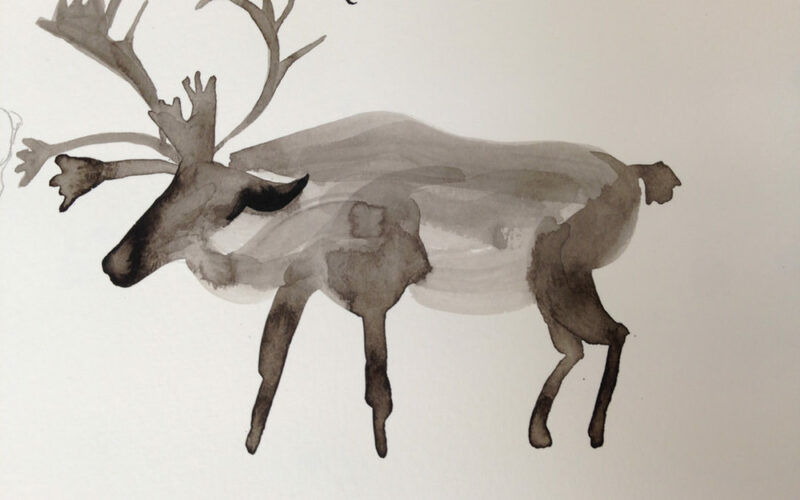 This illustration of a caribou is by artist Jhinuk Sarkar, one of several sketches created during Jhinuk’s research into animals in Inuit territory. See more of Jhinuk’s work here: https://cargocollective.com/paperfig. Thanks for featuring my work, and the credit!